How good or bad any music is, is always an opinion. So many arguments have been caused by people disputing whether a piece of music is good, bad or plain rubbish. Most of the time, you’ll find that it’s a generational thing. If you are old enough to remember when Elvis Presley burst onto the scene with Heartbreak hotel in 1956, all the teenagers of the day went ‘Wow’, or words to the effect, and all the parents and grandparents covered their ears in disgust. The same thing happened when punk was thrust upon us in 1976 and nowadays it happens with rap – mostly because of the unnecessary swearing and generally anyone over about 40 thinks it’s awful. This week’s subject divided the nation at the time of its release. It is one song that I have found has no in-between – you either love it or hate it. It flew up to number two on the UK singles chart in 1981 and dropped just as quickly as it climbed. 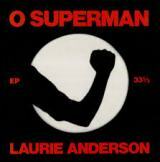 That song, whose chart pattern was 18-2-3-15-24-54, is O Superman by Laurie Anderson. I personally love it and that’s why I helped make it a UK hit. I bet you’re now thinking how I helped make it a hit, or more to the point, why did I make it a hit. Why? Because it was so different and so unique that it just stopped me in my tracks and deserved to be heard and appreciated by millions. How? Well, in the summer of 1981, I was spending a week working on the Radio One Roadshow in Cornwall with Tony Blackburn and one night after we’d driven to the next location, which I think was St. Austell in Cornwall, we’d had dinner, been to the bar and about 11pm I’d gone to my room. I turned on the radio and within 10 mins John Peel was playing this track. My jaw dropped. When I got back to the office the following week I saw John and asked about the track and where he got it from. He showed me the cassette that he had received it on with very little information. I approached an independent promotions guy called Scott Piering and told him that this track had to be licenced in the UK so it can be released. I gave him a copy of the track and he came back to be a few days later in agreement saying, ‘leave it to me, I’ll get it arranged’, and he did. The spoken section is done through a vocoder, very much like E.L.O used in Mr Blue Sky, Herbie Hancock in I Thought It Was you and, 17 years later, Cher did on Believe. Laurie explained it further, “The song is based around a looped ‘ha ha ha ha’ done on a harmoniser, but I wanted it to be like a Greek chorus – not just one voice – so I used a vocoder, which was originally developed as spy technology to disguise voices. It fitted the concept.” Although it’s a loop, there are 1246 ha-ha-ha’s heard on the song. I know, I had to count them four times over for a Radio One competition at the time. In 1977, Bob George formed the One Ten record label and released the very first commercial compilation, a double album called Airwaves which consisted of audio work by visual artists and one of those artists was Laurie Anderson. “I was hired by the Whitney Museum in New York to teach art to school kids,” Bob recalled earlier this year, “the other teacher, starting the same day, was Laurie Anderson. Back then, she was a street artist and would do things like put ice-skates in big blocks of ice and play her violin standing on top of them. I became the co-director of her show and put one of her songs on Airwaves. I urged Laurie to put O Superman out on my label. We got a National Endowment grant for $500 and she recorded it in her hallway because it was the quietest place she could find. I suggested she slow it down slightly to make it longer – it ended up over eight minutes long – so I’d get paid more royalties if it was played on the radio. Since 1998, Laurie began working with Lou Reed contributing a number of tracks to a variety of album and the pair soon became romantically linked, they eventually married in April 2008. Now I know what the subtitle (For Massenet) means – it’s listed like that on a few albums I’ve got.